Heatwave Follows Coolwave. Water Year Rainfall Varies Across Area. Record MEI Drop. 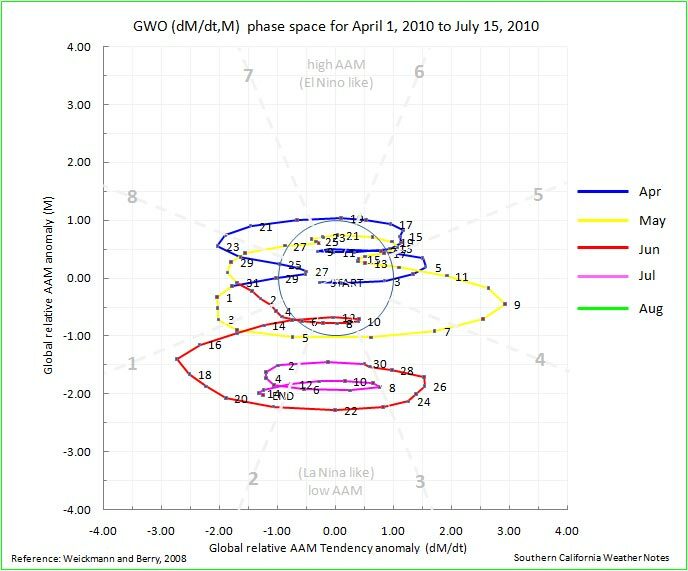 GWO Orbits In La Nina Territory. Following a 26 day stretch in which the temperature at Downtown Los Angeles was below normal 25 of the days, and several lowest maximum temperature records were set around the area, temperatures have soared, and record high temperatures for the date have been recorded at several locations. On June 30, Downtown Los Angeles ended the water year about 8% above normal. Some stations in the Los Angeles area recorded more than this and some less. There was a wide range of values. For example, Long Beach Airport was about 20% above normal and Santa Barbara Airport about 23% above; but Camarillo Airport reported 31% below normal rainfall. 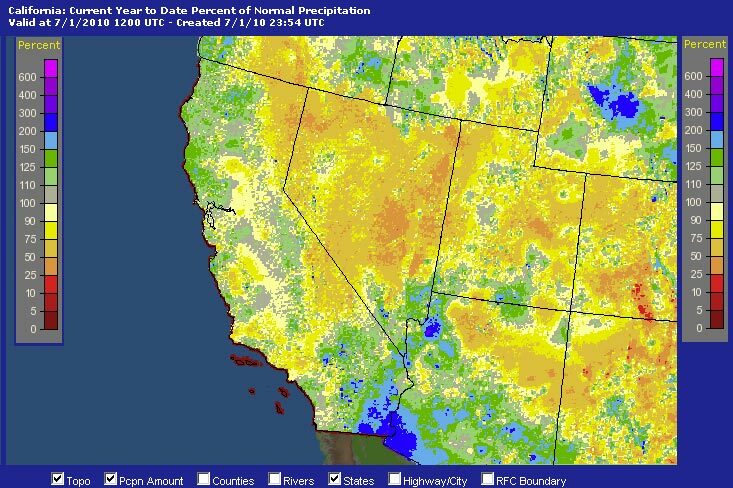 Here's an AHPS graphic showing the percent of normal precipitation in California and the Southwest for the year ending July 1 at 12z. Equatorial Pacific SSTs have generally continued to cool. According to the CPC's Weekly ENSO Update, issued July 12, the latest weekly SST departures were -1.3°C (Niño1+2), -1.0°C (Niño 3), -0.8°C (Niño 3.4), and -0.4°C (Niño 4). According to the CPC, La Niña conditions occur "when the monthly Niño3.4 OISST departures meet or exceed -0.5°C along with consistent atmospheric features. These anomalies must also be forecasted to persist for 3 consecutive months." Reflecting the transition from El Nino to La Nina conditions, the Multivariate ENSO Index (MEI) for May-June experienced an unprecedented drop for the time of year, decreasing nearly 1 standard deviation to a value of -0.41. In addition, the Global Wind Oscillation (GWO) has orbited about -2 SD down on the La Nina side of the phase space plot, and with the atmosphere in a generally low momentum state, may be in that neighborhood for a while. The most recent IRI ENSO Update, released July 15, projects "an approximately 80% probability for continuing La Niña conditions, and a 20% probability for returning neutral ENSO conditions. "